Clarissa "Clary" Adele Fray is the sister of Jonathan Morgenstern and daughter of Valentine Morgenstern and Jocelyn Fairchild. To protect Clary, Jocelyn changes her surname to Fray in order to stay away from the shadow world. Clary is described as having long, curly red hair, freckles, and bright green eyes. She is very short, "a little over five feet" as first described in City of Bones and often viewed as younger than her actual age. In the first book, Clary is 15 years old, approaching 16, about as old as Isabelle Lightwood. Clary is an artist, and at the start of the first book, City of Bones, it is at first believed that she is a mundane, an ordinary human because her mother kept it a secret from her. It is later revealed that she is a Shadowhunter, or Nephilim: a human with angelic qualities. Clary is described as being stubborn and often rushes into dangerous situations without considering the consequences. Her best friend in the series is Simon Lewis. He is in love with her but she is romantically involved with Jace (who uses various surnames). Clary is devastated when she is told that Jace is her brother but later learns that this is untrue. Clary discovers she can read ancient runes that are used by angels, and she can create her own runes, an ability that was caused by the extra angel blood her father, Valentine Morgenstern, administered to her while she was in her mother's womb. In the first few books, Clary has a tense relationship with the Lightwoods siblings. Alec Lightwood, Jace's parabatai or best friend, is seemingly jealous of Clary's relationship with Jace since he is in love with Jace however as they are parabatai they can't be together, while Izzy Lightwood shows hostility towards Clary at the beginning since she thinks Clary is just a normal human being. Jace Christopher Herondale (also referred to as Wayland, Morgenstern, and Lightwood, known as the brother of Clarissa "Clary" Adele Fray and sometimes referred to as Jonathan in early series) is described as being tall and muscular with scars across his golden skin from faded magical marks called Runes. He has wavy blond hair and golden eyes, and, like Clary, is a Shadowhunter. Jace is among the Nephilim's best fighters, since Izzy stated that he's killed more demons than anybody his age, and readily defends his family. Jace is often flirty and insensitive, and is described as projecting a false arrogance due to an insecurity that he is not good enough. Throughout the books, Jace's biological family is unknown until the last few books, although he refers to Isabelle, Alec, and Max as his siblings, and Maryse and Robert Lightwood as his parents. In City of Bones, he believes he is a Wayland but at the end of the book Valentine Morgenstern falsely tells him that he is Jace's father. In City of Glass, Jace learns that his biological father is actually Stephen Herondale. He goes by the surname of his adoptive family, the Lightwoods but changes it back to Herondale upon learning more about his true father. Like Clary, he has special powers which make him swift and graceful, caused by the extra angel blood he received while in his mother's womb. His parabatai is Alec Lightwood. Parabatai refers to a pair of Nephilim warriors who fight together as lifelong partners; this is represented as a permanent rune that allows both individuals to be connected to each other. Simon Lewis (also referred to as Lovelace) is a tall, thin boy with a mop of curly brown hair, brown eyes, and wears glasses. He often wears T-shirts with gamer slogans. In City of Lost Souls, Simon describes himself as being a "hipster," but his best friend, Clary, refers to him as a "geek". Simon is the only character to begin life as an ordinary human (called a mundane), but in City of Ashes he is transformed into a vampire. After becoming a vampire, he never ages and physically will remain 16 years old. He gets taken care of by Raphael Santiago. Valentine Morgenstern stabs Simon in the throat and slits his wrists for the one-fourth vampire blood needed to convert the Mortal Sword. Jace finds Simon and cuts his own wrist to let Simon drink his blood, thus resulting in Simon becoming a Daylighter. Simon is quirky and caring, often putting other people before himself. In City of Fallen Angels, Simon finds himself in a love triangle with the characters of Maia Roberts and Isabelle Lightwood; however, in City of Lost Souls he chooses Isabelle over Maia. Isabelle "Izzy" Sophia Lightwood is a sixteen years old Shadowhunter that is described as tall, thin, and beautiful. She has long black hair and dark brown eyes, and is often carrying her trademark gold electrum whip, as shown in City of Bones, where Izzy attracted a shape-shifter blue-haired demon in the Pandemonium. Isabelle is described as being incredibly girly but with a fierce attitude. She often seems flirty and cannot hold a serious relationship, until she becomes interested in Simon Lewis. In City of Lost Souls, she admits to being in love with Simon Lewis and in City of Heavenly Fire she becomes Simon Lewis' girlfriend. Alexander "Alec" Gideon Lightwood is the oldest Lightwood sibling. Alec is a Shadowhunter with floppy black hair and blue eyes. He is described as being quiet but protective of his younger siblings: Isabelle and Max, the latter of whom dies in City of Glass. Alec believes he is in love with Jace, his best friend and parabatai in the first book, City of Bones, until he meets Magnus Bane. In City of Glass, Alec kisses Magnus in front of his parents, revealing to them that he is gay. In City of Fallen Angels and City of Lost Souls, Alec becomes insecure about his and Magnus' relationship because of Magnus' immortality and considerable romantic history. This insecurity leads him to consider turning Magnus into a mortal against his will, which causes Magnus to end their relationship in City of Lost Souls. However, Magnus and Alec eventually reconcile in City of Heavenly Fire. Magnus Bane is the self-described freewheeling bisexual High Warlock of Brooklyn. Magnus is an approximately 400-year-old warlock who appears to be 19. He is tall and thin with jet black hair and amber and green cat eyes. Magnus Bane is often described as glittery, and he throws countless parties with Downworlders. Magnus is involved with Jocelyn, Clary's mom, to erase Clary's memories of the Shadowhunter world. Magnus begins a relationship with Alec Lightwood and therefore feels obliged to become the New York Shadowhunters' "pet" warlock to impress him. Magnus appears in the prequel to The Mortal Instruments — The Infernal Devices — as well as in a series of 10 short stories describing some of the more major events that occurred in Magnus Bane's life before the events of The Mortal Instruments which have been collected in an anthology titled The Bane Chronicles. In The Bane Chronicles, Magnus is romantically involved with a vampire named Camille and various others which are never again mentioned. His parents are an unnamed Indonesian woman and the demon Asmodeus. Lucian "Luke" Garroway (Graymark) is a former Shadowhunter and the former second-in-command of the Circle. When he was younger he was best friends and parabatai with Valentine. However he was soon betrayed by Valentine who led him into a trap where he was bitten by a werewolf, causing him to become one. He was the leader of the Manhattan werewolf pack, proceeded by Maia Roberts. His fiancè is Jocelyn Fairchild and is Clary's step-father. He is described as calm, level-headed and righteous. He is also fiercely loyal to his loved ones. Jocelyn Fray (Fairchild) is a Shadowhunter, a former member of the circle, and the mother of Clary and Jonathan Christopher Morgenstern. She was once married to Valentine but following the birth of their first child, Jonathan, she learned that Valentine mixed demon blood into her food, thus making Jonathan into a monster. Valentine again mixed angel blood into Jocelyn's food, unaware that she was pregnant with Clary. After he faked his and Jonathan's deaths, Jocelyn left Idris and moved to Brooklyn where she gave birth to Clary. Every two years Jocelyn had Magnus Bane cast a block on Clary's "Sight" or "inner eye," to prevent her from seeing the Shadow world. In City of Bones she self-induces a coma to prevent Valentine learning the whereabouts of the Mortal Cup. She is reawakened in City of Glass. She is currently engaged to her childhood friend, Luke Garroway. Her current surname, Fray is revealed to be a portmanteau of her initial maiden name, Fairchild, and that of Tessa Gray, a warlock seen in City Of Heavenly Fire, and the prequel series, The Infernal Devices. Jonathan Christopher (Sebastian) Morgenstern is Clary's brother. Like her, he is a Shadowhunter but he was born with demon blood in his veins. It was administered to him by his father, Valentine, while his mother, Jocelyn, was pregnant. Jonathan is described as having pitch black eyes with no whites (as a baby, but when he is older, they are simply black on the inside), a sharply angled face, and blonde, almost-white hair. At the end of City Of Heavenly Fire the evil is burnt out of him, and his face becomes rounder and his eyes turn green. He dies soon after admitting and apologizing for his wrongdoings to Clary and their mother. City of Bones was highly popular at the time of release, reaching #8 on the New York Times Best Seller list (Children's books) in April 2007. City of Ashes was one of the YALSA's top ten teen books for 2009. Publishers Weekly commented that it "is a sprawling urban fantasy packed with just about every type of creature known to the genre". Locus praised the book as "a highly readable first novel". Booklist said that there was "plenty of romance, loss, honor, and betrayal to make the journey worthwhile. An experienced storyteller, Clare moves the plot quickly to a satisfying end." School Library Journal said "Though the story is hampered by predictability and overblown writing, Clare continues her talent for mixing hip, modern humor with traditional fantasy, and fans eagerly awaiting the series conclusion should come away more than satisfied." A review in the School Library Journal noted that the book contained a variety of narrative flaws including characters that were "sporadically characterized" and whose behavior was predictable. In spite of this they noted that the book was entertaining and would leave readers anticipating the next installment. The series has been in the New York Times Best Sellers List for 102 consecutive weeks as of September 5, 2013, and No. 1 for 9 weeks straight, knocking series such as The Hunger Games and Percy Jackson and The Olympians off the top spot. The last time The Mortal Instruments spent 100 consecutive weeks on the best sellers list was in May 2012. 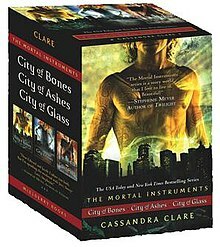 On August 29, 2013, City of Bones topped the USA Today’s Best Sellers List, which made it the Best Seller Book of the country at the time. Four other Mortal Instruments books also made the list. City of Ashes was No. 8, City of Glass was No. 20, City of Fallen Angels was 35 and City of Lost Souls was No. 46. The main theme revolving around each of her works is the idea of self-acceptance and coming into one’s own in relation to the choices we make and the consequences that follow. Clare focuses on heavy subjects throughout her novels. She explores sexual orientation through several main characters who are gay or bisexual (i.e. Alec in The Mortal Instruments; Magnus Bane in both The Mortal Instruments and The Infernal Devices), hones in on shifting family dynamics and the ways that family ultimately take priority, and infuses a few multicultural characters (Magnus is half Indonesian, half Dutch; Jem of The Infernal Devices is half Chinese; Maia Roberts, the leader of the New York werewolf pack, is biracial) into a plot filled with a multiplicity of characters. In City of Ashes, the Faerie Realm and its inhabitants are characters from Holly Black's faerie series, beginning with Tithe: A Modern Faerie Tale. Also, the characters Val and Luis from Valiant: A Modern Tale of Faerie appear in another scene in that book. Within Holly Black's third book, Ironside: A Modern Faery's Tale, there is a reference to the Mortal Cup mentioned in the Mortal Instruments series. Clare delved deeply into world mythology in order to build the Shadowhunter world featured in The Mortal Instruments, The Infernal Devices, and all other offshoots of the series. There are strong influences from Paradise Lost and The Inferno; while there are many references to Western religious mythology, Clare also studied world mythology deeply, specifically demonic myth featured in Japanese, Tibetan, and other Eastern cultural texts. Her references to angels and nephilim throughout the series also come from this study of world religions and folklore. These myths were then adapted to fit into her stories. Cassandra Clare has written a series of prequels called The Infernal Devices set in the same universe as The Mortal Instruments, but in Victorian London. This series consists of three books: Clockwork Angel, published on August 31, 2010, Clockwork Prince, published December 6, 2011, and Clockwork Princess, published March 19, 2013. There is a sequel series to The Infernal Devices called The Last Hours set in the same universe detailing the adventures of the next generation of Shadowhunters almost two decades after the events of Clockwork Princess. The series will consist of three books: Chain of Thorns, Chain of Gold, and Chain of Iron. In reading the prequel series, readers will find strong connections between the main characters in The Mortal Instruments and the protagonists of The Infernal Devices, not just in similarity of characterization but in actual familial connections. First editions of The Clockwork Princess, the final book in this trilogy, include a family tree that links the characters in The Infernal Devices with the generations of The Mortal Instruments and The Dark Artifices. One of the main characters from The Infernal Devices also takes part in the last three Mortal Instruments books (with another one joining in the last book), in addition to Magnus Bane, who takes part in all Mortal Instruments and Infernal Devices books. Cassandra Clare has announced a new series of sequels called The Dark Artifices set in the same universe as The Mortal Instruments, but five years in the future. This series will be a trilogy with many new characters (plus some from City of Heavenly Fire) and the focus will shift from New York to the Los Angeles Institute. The first book, Lady Midnight, was published on March 8, 2016. The second book, Lord of Shadows was released on May 23, 2017. The Queen of Air and Darkness was published on December 4, 2018. Cassandra Clare, Sarah Rees Brennan and Maureen Johnson have written a complementary series of ten short stories called The Bane Chronicles that recount the experiences of the Warlock Magnus Bane character from The Mortal Instruments series. This series has been published over the course of 2013 and 2014 and consists of "What Really Happened in Peru", "The Runaway Queen", "Vampires, Scones, and Edmund Herondale", "The Midnight Heir", "The Rise of the Hotel Dumort", "Saving Raphael Santiago", "The Fall of The Hotel Dumort", "What to Buy the Shadowhunter Who Has Everything (And Who You're Not Officially Dating Anyway)", "The Last Stand of the New York Institute", and "The Course of True Love (and First Dates)". Cassandra Clare and Sarah Rees Brennan also wrote a next series of books called The Shadowhunter Academy that is based on Simon Lewis, Clary's best friend and Isabelle's boyfriend as he journeys to become a Shadowhunter. The series consists of ten books that will be released over the course of 2015. The books and release dates are: Welcome to Shadowhunter Academy, February 17; The Lost Herondale, March 17; The Whitechapel Fiend, April 21; Nothing but Shadows, May 19; The Evil We Love, June 16; Pale Kings and Princes, July 21; Bitter of Tongue, August 18; The Fiery Trial, September 15; Born to Endless Night, October 20; and Angels Twice Descending, November 17. There were graphic novel versions of her series released within the past several years to appeal to an even wider audience. Half Of The City of Bones, The Clockwork Angel, The Clockwork Prince, and The Clockwork Princess have all been released in graphic novel form by Th3rd World Publishing. In 2010, Screen Gems announced that they were going into production on the film adaptation of City of Bones, the first book in The Mortal Instruments series, with hopes of starting a successful film franchise. The film was originally due for release on August 23, 2013, but was brought forward two days earlier, on August 21, 2013. The film premiered on August 12, 2013, at the Cinerama Dome in Hollywood. Production on a film adaptation of the second book, City of Ashes, was due to start in September 2013, but was delayed to 2014, and eventually cancelled, after the first film failed to recoup its budget. On October 12, 2014, at Mipcom, Constantin confirmed that The Mortal Instruments will return as a television series with Ed Decter as showrunner. Constantin Film and TV head Martin Moszkowicz told The Hollywood Reporter that, "It actually makes sense to do [the novels] as a TV series. There was so much from the book that we had to leave out of the Mortal Instruments film. In the series we'll be able to go deeper and explore this world in greater detail and depth." The producers hope to adapt the entire book series if the TV adaptation proves successful. In February 2015, book series author Cassandra Clare announced via Twitter that the television series would be called Shadowhunters rather than The Mortal Instruments. In March 2015, ABC Family picked up Shadowhunters straight-to-series. The series was renewed for a second season in March 2016, consisting of 20 episodes, which premiered on January 2, 2017. In April 2017, it was announced that the series was renewed for a third season of 20 episodes. The first half of ten episodes is set to premiere on March 20, 2018, while the second half will air from mid-2018 onwards. ^ a b "My Bio - Cassandra Clare". cassandraclare.com. ^ "Children's Books". nytimes.com. April 22, 2007. Retrieved 2008-07-10. ^ "The 2008 Teens' Top Ten". ala.org. ^ "Children's Book Reviews: Week of 4/9/2007". Publishers Weekly. 2007-04-09. Retrieved 2008-01-11. ^ "Booklist Review: City of Glass". Booklist. Retrieved 15 August 2012. ^ Langhans, Eliza. "Grades 5 & Up". School Library Journal. Retrieved 15 August 2012. ^ "Clare, Cassandra. City of Bones. (Brief article)(Children's review)(Book review)". School Library Journal. 2007-05-01. Retrieved 2008-01-11. ^ "New York Times Bestsellers List – TMI Source". tmisource.com. Retrieved 2017-01-25. ^ "The Mortal Interview: Cassandra Clare on Diversity". Racebending.com. ^ Henderson, William. "Want to Know How Cassandra Clare's Widely Anticipated Clockwork Princess Begins?". Huffington Post. Retrieved 15 August 2012. ^ "The Last Hours - Cassandra Clare". cassandraclare.com. ^ "Clockwork Princess Special Content - Cassandra Clare". cassandraclare.com. ^ Driscoll, Molly (March 15, 2012). "Cassandra Clare offers a few hints about her next Shadowhunters series". Christian Science Monitor. Retrieved 15 August 2012. ^ "The Dark Artifices". cassandraclare.com. Retrieved 26 September 2016. ^ "The Bane Chronicles". Shadowhunters. ^ "Tales from the Shadowhunter Academy". Shadowhunters. ^ "Graphic Novels - Cassandra Clare". cassandraclare.com. ^ Bettinger, Brendan (October 4, 2010). "Screen Gems Positioning CITY OF BONES as the First Film in a MORTAL INSTRUMENTS Franchise". Collider. Retrieved May 12, 2015. ^ "Jonathan Rhys Meyers Heads to The Mortal Instruments: City of Bones". Coming Soon. Archived from the original on September 29, 2013. Retrieved August 15, 2012. ^ Stedman, Alex (August 13, 2013). "Cassandra Clare Brought to Tears on 'Mortal Instruments' Set". Variety. Archived from the original on August 15, 2013. Retrieved August 16, 2013. ^ Saunders, Louise (August 13, 2013). "Pure and simple! Ashley Greene opts for demure glamour in effortlessly chic cream shift minidress at The Mortal Instruments: City Of Bones premiere". Mail Online. London: Daily Mail. Archived from the original on August 13, 2013. Retrieved August 16, 2013. ^ Lincoln, Ross A. (January 9, 2016). "'Shadowhunters' Cast & Producers Pledge Faithfulness To Popular Novels – TCA". Deadline Hollywood. ^ a b c Barraclough, Leo (October 12, 2014). "Constantin to Produce TV Series Based on 'Mortal Instruments,' 'Resident Evil' Franchises". Variety. Archived from the original on October 15, 2014. Retrieved May 12, 2015. ^ Roxborough, Scott (October 12, 2014). "MIPCOM: 'The Mortal Instruments' to Return as TV Series". The Hollywood Reporter. Archived from the original on October 15, 2014. Retrieved May 12, 2015. ^ "Cassandra Clare Reveals THE MORTAL INSTRUMENTS TV Series Name". TheFandom.net. February 22, 2015. ^ Wagmeister, Elizabeth (March 30, 2015). "'The Mortal Instruments' Series: ABC Family Orders 'Shadowhunters'". Variety. ^ Goldberg, Lesley (March 14, 2016). "'Shadowhunters' Renewed for Second Season at Freeform". The Hollywood Reporter. ^ "'Shadowhunters Season 2! Freeform Picks Up Shadowhunters For A Second Season!'". Shadowhunters TV. March 14, 2016. ^ Patten, Dominic (October 8, 2016). "'Shadowhunters' Reveals Season 2 Debut Date & 'Vampire Diaries' Star Directing – NY Comic-Con". Deadline Hollywood. Retrieved October 11, 2016. ^ "New year, new date". shadowhunterstv. Retrieved December 15, 2017. ^ Goldberg, Lesley (October 7, 2017). "'Shadowhunters' Scores Additional 10-Episode Freeform Order". The Hollywood Reporter. Retrieved October 10, 2017. This page was last edited on 3 March 2019, at 16:12 (UTC).